Looking for a unique gift for friends and family? Consider giving the gift of music. Special package deal- order 2 CDs for $35, 3 for $50 (normally $20 each). Please add 2.95 for Shipping and handling. Some Holiday Classics to help keep spirits bright. Songs include: Angels We Have Heard on High, Deck the Halls, Drummer Boy, Greensleeves, God Rest Ye Merry Gentlemen, White Christmas, Silent Night, River, O Come O Come Immanuel, Go Tell it on the Mountain, We Three Kings and We Wish You a Merry Christmas. 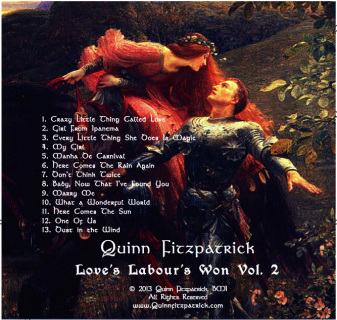 Quinn's second volume of popular songs of the 20th and 21st Centuries. Songs: Crazy Little Thing Called Love, Girl From Ipanema, Every Little Thing She Does Is Magic, My Girl, Manha De Carnival, Here Comes The Rain Again, Don't Think Twice, Baby, Now That I've Found You, Marry Me, What a Wonderful World, Here Comes The Sun, One Of Us, Dust in the Wind. This collection has been described as "fun." 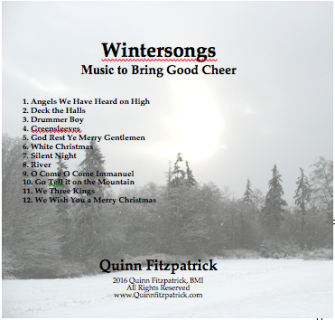 Quinn's first volume of well-loved popular songs. Songs included: Hallelujah, Wonderful Tonight, And I Love Her, More Than Words, Fields of Gold, Stand By Me, Can't help Falling in Love, Wild Mountain Thyme, Waiting for A Girl Like You, Annie's Song and Every Breath You Take. This collection has been described as "soulful." Quinn's original solo guitar instrumentals have been compared to the styles of Will Ackerman and Leo Kottke. Let Quinn provide live music at your next event- any style and any sized venue! 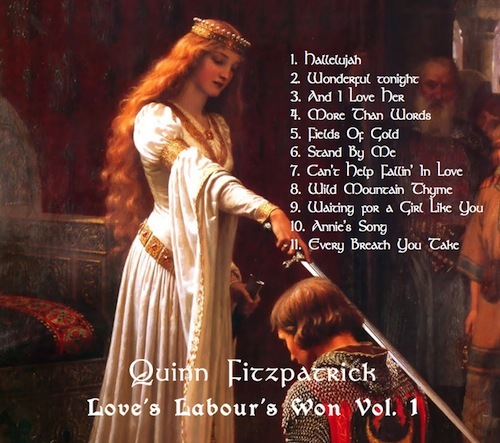 Quinn Fitzpatrick is a articulate and talented guitarist and songwriter. 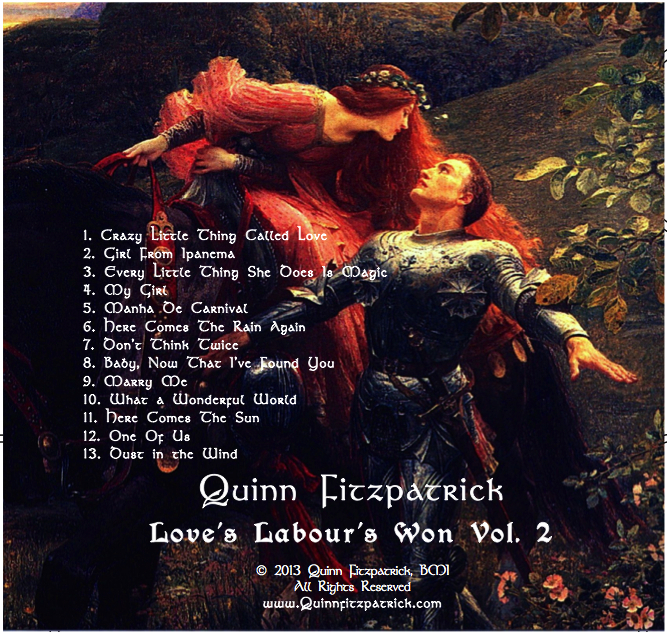 I'm a poet and I love words, but Quinn's music is so richly textured that words would only get in the way. 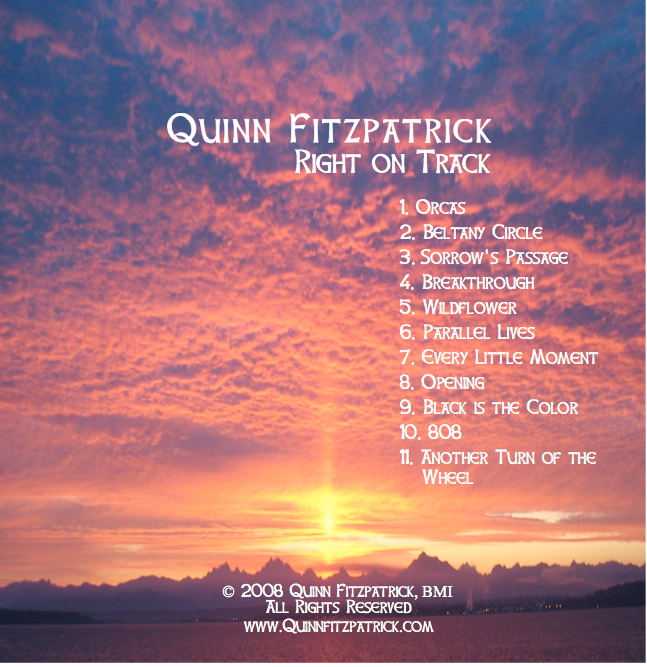 When I listen to his CD "Right On Track" I leave the details of life behind and drift on beauty. Quinn's music adds a touch of class to any event. I want to invite Quinn Fitzpatrick to my house and play the soundtrack to my life. Having your music at the market is a breath of calming air. I relax, I smile, and so does everyone else. I play your CD in my baking kitchen, usually first thing in the morning to ease into the day and again at the end of a long day, to unwind. You have a great talent and aren't we all lucky that you choose to share it!